The Macomb County mother at the center of a federal adoption probe may be in hot water again. The 7 Investigators have learned Tara Lee may have violated the conditions of her bond, even after she was already brought in front of a judge last week for other bond violations. (WXYZ) — The Macomb County mother at the center of a federal adoption probe may be in hot water again. The 7 Investigators have learned Tara Lee may have violated the conditions of her bond, even after she was already brought in front of a judge last week for other bond violations. Promising babies that didn’t exist, having women pose as fake birth moms, taking more than $200,000 from couples across the country hoping to adopt, those are just a few of the allegations the FBI describes in a criminal complaint unsealed in January that charges Tara Lynn Lee with federal wire fraud. When the 37-year-old faced a judge after her arrest in January, the federal magistrate agreed to let her out of custody on a $10,000 bond if she promised several things, including giving up her passport and having no contact with any of the birth moms or adoptive parents involved in her case. “That means no personal contact, no telephonic contact, no internet contact, no social media contact, no contact through third persons,” said Magistrate Judge Mona Majzoub to Lee during her hearing on January 9, 2019. “Yes, your honor,” said Lee. Moriah Day says she placed her baby for adoption through Tara Lee last year. Moriah says she and other birth moms have been contacted by Lee while she’s been out on bond. “Since she was arrested, has she contacted you,” 7 Investigator Heather Catallo asked Moriah. “How many times,” asked Catallo. “At least 4 or 5,” said Moriah. “But she’s not supposed to,” asked Catallo. Moriah says she originally sought help from Lee when she found out she was pregnant because she believed Lee was a licensed social worker working for a licensed adoption agency. 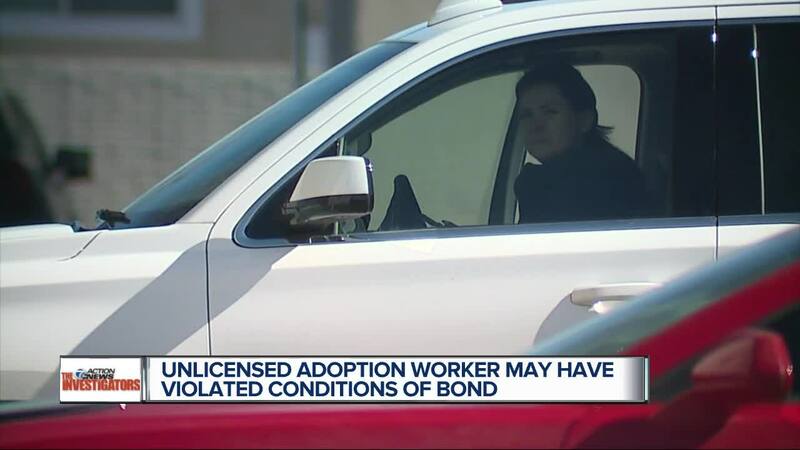 But state officials confirm Lee and her Always Hope Pregnancy and Education Center LLC were never licensed to do adoptions, and the state has since gotten a permanent injunction to stop Lee from working on adoptions. “I’m mad at Tara because if I found the right person, when I found out I was pregnant, if I found a real social worker-- I might be a mom right now… If someone believed in me enough that I could do it on my own,” said Moriah. Federal prosecutors say last week, Lee was found to be in violation of her original bond restrictions from January 9, 2019. Lee and the judge signed those conditions of release on Friday February 22, 2019. But on Monday February 25, 2019 our cameras were rolling while Lee appears to be using a smartphone inside one of her vehicles. It’s not clear yet if Lee will be found in violation of her bond conditions yet again. If she is, she could be locked up. Tara Lee’s attorney told us he’s waiting on more discovery and he’s not prepared to give us an official statement at this time.